Pay Scale: Rs. 5200-20200 Grade Pay Rs 1900. Application Fee: Rs. 500 for GEN/OBC, Rs. 250 for SC,ST,OBC candidates with Rs. 40 E-Mitra/ CSC kiosk charges. Age Limit : Candidates age should be between 18 years to 35 years. (Age relaxation will be extended to reserved categories as per Govt. of Rajasthan rules. Selection Process: Selection will be based on your 12th Marks with Bonus marks to candidates already working in department on contact basic. Basic on Experience of 1 year, 2 year, 3 years or more bonus marks of 10, 20 or 30 will be awarded. Qualification : Candidates who wish to apply must have passed Intermediate / 12th Class/ 10+2 from any recognized Board / Institution.Full details regarding qualification will be published very soon in official notification very soon. iam from south i can apply ? Reply.I am waiting Your answer. hello sir,,, i have completed bca with 65% but i have only 58 mark in 12th with cbse board, and sir i am an international gold medlist in taekwaondo(martial art), and won gold medal last month in state tournament. i read in today's new paper that there is a chance for sportsman, sir plz let me know, do i have chance to qualif? sir, degree in BE(information technology) eligible for Ldc recruitment 2013.plz tell waiting for answer. Gulsher,sir mere 74% h aur rkcl bhi h kya no. Aa sakta h aur m konse dist. Se bharu plz reply..
sir, I have obtained 84.00% marks in senior secondary exam. i also achived the information technology training certificate by passing relevent exam orgainized by CA.INSTITUTE, JAIPUR branch as a ca student.this is also a computer certificate of basic and IT. knowledge. 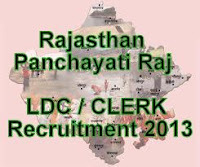 please inform me form my eligibility to apply for ldc direct recuritment 2013.